Speculators have established their largest ever net long position in crude oil futures; are they about to get drilled? While all of the attention is on the feats of levitation being displayed by the stock market, lots of other things are rallying as well. That includes crude oil, which is up about 7% to start the year, and roughly 50% in the past 7 months. And while the rally still leaves the price of oil nearly 50% below its highs of just 4 years ago, by some measures, the excitement surrounding the commodity surpasses even that of stocks. At least one might make that argument based on trader positioning in the crude oil futures market. There, we see via the CFTC’s Commitment Of Traders (COT) report that Non-Commercial Speculators currently hold a net-long total of over 650,000 contracts, far and away the largest net-long position on record. As a refresher, Speculators are by and large commodity pools and hedge funds that exist mainly to trade the market long and short. These funds are normally trend-following entities. And while they can be on the correct side of a long trend, at extremes they are considered “dumb money” as they are typically off-sides. 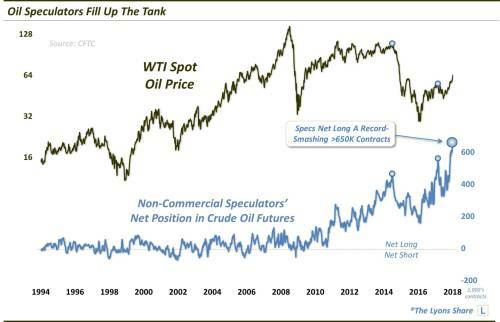 So, obviously, the concern for oil bulls is that Speculator long positioning is at an unprecedented extreme. Recent history reinforces the notion that such Speculator long extremes do not typically end well for them. For example, the last 2 times we wrote about the Speculators holding a substantial long position, July 2014 and January 2017, oil prices subsequently dropped by 75% and 20%, respectively. This trader positioning does not guarantee that oil prices will immediately collapse from here — or even cease their current ascent. Any unwind of Speculator longs likely won’t begin until prices begin to fall, thus putting pressure on their position. Considering their massive record long position, though, the potential magnitude of the unwind could be massive. 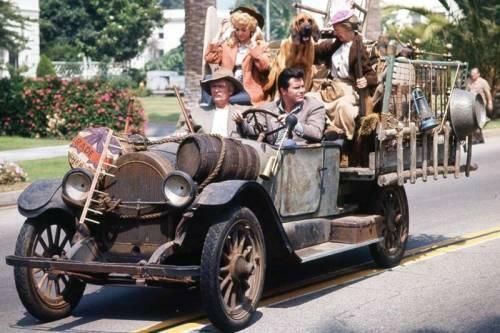 Therefore, should prices begin to leak, oil bulls might not want to stick around too long lest someone strikes a match.